When I was about to graduate college and planning my ~big move~ to the ~big city~, I distinctly remember keeping a running wishlist on IKEA of all the things I was going to outfit my new place with, once I saved up a little. I dreamt of a lofted bed — a classy one with a real ladder, and not the box I used as a stepping stool in my college freshman dorm room — with enough space for a little reading nook underneath, and a full desk and dresser to line the opposite wall. I knew city living would be tight, so I’d be able to fit everything I wanted by sacrificing just a little bit, and outfitting my apartment for vertical living — putting my bed up high, for instance, to make up more floor space! Guys, that is not what happened. After we settled on an apartment, the measurements of my bedroom told me that while, yes, I would be able to fit a queen-sized bed in the room, that’d be basically it. I have about a foot and a half of space to walk on two sides of it, making for just barely enough room to open my closet door all the way. Maybe I could have figured out a lofted bed situation, but it would have been like adding a second ceiling, and sinking my bedroom further into the cavern of no natural light that it already exists in. So, I’ve had to be a little creative with how I utilize my space. I am not exactly the world’s neatest individual by default, but thankfully, I do have the benefit of high ceilings and lots of cabinet and closet space. (A good quality step stool has been one of my most-used items.) And, since New York apartments are a cost-per-square-foot joke, I’ve also seen a lot of unique uses of space in my visits to friends’ apartments. If you’re looking for creative ways to make the most out of your wall space — or even just spruce it up a little! — here are some of my favorite wall hacks I’ve come across. One of my favorite things I’ve gotten for my apartment is a small mounted basket with hooks on the bottom. It’s meant to hold mail and keys, but as long as I don’t put super heavy things on it, it can hold a lot more. It’s utilitarian but actually cute, and I use it to hang all my scarves — keeping them conveniently in plain sight for when I’m putting an outfit together. I use the basket portion to hold hats and gloves and other small accessories, and I love that I can easily see what it’s holding. There are so many shelving solutions out there that don’t involve actual shelves. This easy tutorial shows how you can turn some baskets (well, perfectly square or rectangle ones — not just any baskets) into chic bathroom shelves. I think they would also make for some cute display shelving in a bedroom or office! 4. Use wrapping paper as decor. In my bedroom, I have a lot of things on the walls, especially higher up — it’s a good way to utilize space that I can’t reach, and makes the whole room feel more “done.” This is probably one of my favorite decorating hacks: pick out a wrapping paper you really like and make it into wall art. $10 may be a lot to spend on a roll of paper that’s just going to be torn apart once the gift it’s covering is opened, but as a big print you can frame and keep forever? That’s a pretty good deal. I recommend keeping an eye on Michael’s sales and daily coupon deals for a discount on a large frame. If you have a membership to a warehouse club like Costco or Sam’s Club , you may also want to look there for affordable frames. Another idea is to use a piece of wrapping paper to cover up some cork board for a super chic, printed bulletin board. 5. Mirrors across from windows. For a lot of city apartments, little space means not very much light. By putting a wall mirror across from a window, you can make a room appear a little brighter, thanks to all the reflected light. It also makes a room feel bigger than it is, which is crucial for living in a cramped apartment. 6. Hangers for folding chairs. I love entertaining, but we’ve sometimes found ourselves with more people in the apartment than we have seats for. 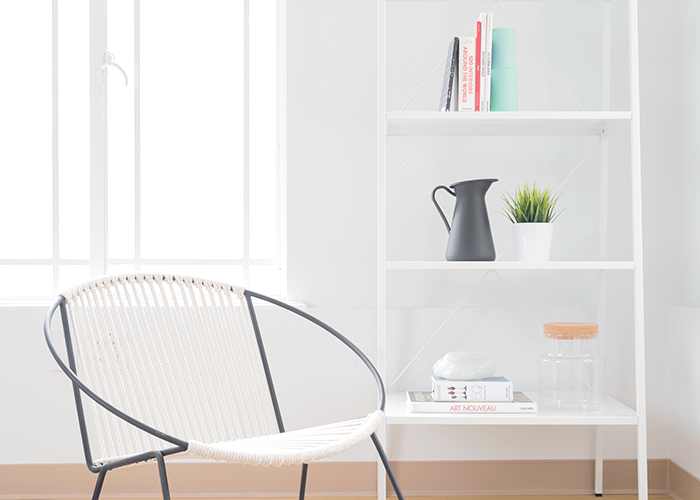 If you want to keep a couple of extra chairs around but don’t have much space for them, consider folding chairs that stay on wall hooks when not in use. And don’t resign yourself to ugly rec center metal folding chairs — cute ones exist! I have extremely tall kitchen cabinets, which are very useful for many things, but my shallower objects that can’t be stacked — like mugs — end up taking up more space than they’re worth. Adding some under cabinet hooks would seriously clear up some space by giving me somewhere else to put my many, many coffee mugs. Again, my cabinets are very tall, but they don’t have as many shelves as I’d like them to. I had a similar problem in my college apartment; the cabinets were shorter, but they each only had one shelf. We ended up using stackable shelves to expand the space we were working with, and they were a real life-saver. I seriously can’t recommend one of these enough, especially when you don’t have enough counter space to dedicate to a knife block. They make you look like you’re about to head out the door to film an episode of Chopped, and also keep your knives nice and clean and out of the way (and not getting grimy in a drawer…or your sink). 10. Found objects gallery wall. Even though it seems a lot easier said than done, in my opinion, wall art just looks better framed. A gallery wall can really do wonders to fill out a space, and it doesn’t mean you have to spend a ton of money on each individual piece. Roughly 60% of everything I have framed in my home is a postcard or old greeting card that is either a) sentimental or b) just really cute. Without much effort — collecting images from old magazines, Xeroxing family photos, cutting up old calendars, or buying downloadable prints you can print out multiple times — you could outfit a gallery wall for very cheap. I personally like to mix and match frames, while other people like to keep things uniform with a bunch of the same color — up to you!